Some Thanksgiving thoughts for the U.S. Thanksgiving holiday. 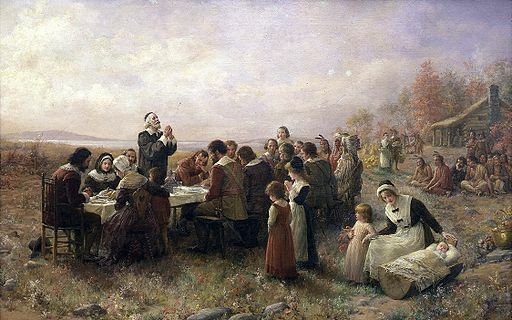 Despite various corrections and critiques (e.g., here and here), schoolchildren across the U.S. often learn and even reenact the story of Pilgrims and Native Americans joining together for a meal to celebrate the first harvest for the Pilgrims. When considered from the perspective of the study of processes of identification, the reenactment of this origin story perpetuates the position of dominant groups, despite the narrative of cooperation built into the origin story. Maintaining this position of dominance may not be the intention of those teaching the story and encouraging the reenactment, yet the dominance is embedded simply within the standard framing of the story. The Pilgrims are a specific group of colonists at a particular place at a particular time. The Indians, on the other hand, are typically represented as the undifferentiated other, despite the details in the story that describe the Wampanoag, who had an alliance with the Plymouth colony, as participating in the “first Thanksgiving” in 1621. Reenactments and typical images of the “first Thanksgiving” attempt to recreate a specific image unique to the Pilgrims, but not the Wampanoag. Instead the Wampanoag are presented according to a homogenized image of Native Americans, complete with feather headdresses more common with some Native Americans in the Plains. The Wampanoag are not important enough to warrant attention to their cultural uniqueness. All sorts of stories often have this character. The relative level of individual details about various participants reinforces the hierarchy of importance for those participants in the story. Even when such hierarchies are not the overt moral of the story or intention of the storytellers, the retellings and reenactments reinforce these embedded hierarchies that keep the Other constructed as unimportant and undifferentiated. Often the dominant group is hardly aware of either the details that are overlooked or the ways it maintains their dominance. Previous PostPrevious Did You Get a Piece of the Edge?